The method was adapted in the frame of Komrong Daikou project led by AVSF in Cambodia between 2007 and 2010, which aimed at reducing poverty by strengthening Farmers Organisations (FOs). The project encouraged FOs to develop useful services to their members through a capacity building process including scoring criteria method. It involves FO leaders and members in defining evaluation criteria of well-managed and successful FO, according to their nature and objectives, and of their projects/activities, scoring these criteria and using the results to adapt support and improve themselves. This method has been developed in the frame of a global process that consists in communities’ participation and empowerment. 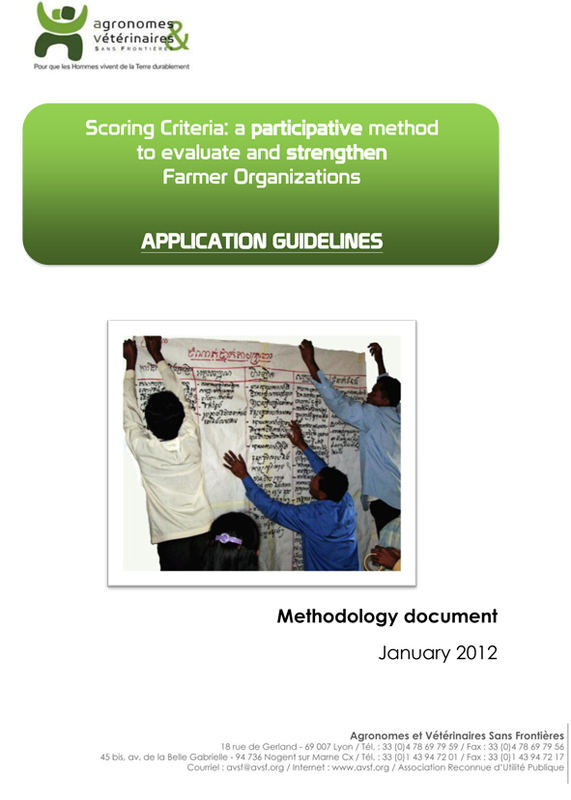 It is thus a participatory process of evaluation and capacity-building. The method was adapted in the frame of Komrong Daikou project led by AVSF in Cambodia between 2007 and 2010, which aimed at reducing poverty by strengthening Farmers Organisations (FOs). The project encouraged FOs to develop useful services to their members through a capacity building process including: meetings, exchanges, information sharing and trainings on management and techniques, monitoring - designing, implementing and evaluating FOs projects proposals (“micro- projects”) financially supported by Komrong Daikou. This experience proved that it is a very stimulating process as the support includes farmers’ perceptions, action and commitment instead of following an external agency decision.